Find OUR posts on kid wardrobe trends, styling tips, news on kids fashion and more! Add ‘Khandaan’ to kids, candy and costumes this Halloween with these 5 easy to put-together costumes for the family! 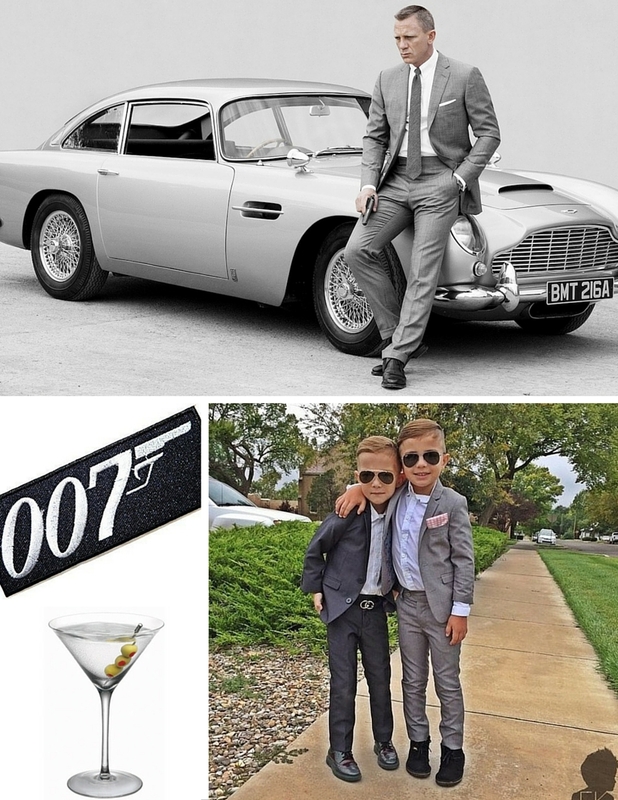 Turn the tables on the baddies by teaming up with your son to play MI6 agents. Bond girl: Mommy can turn up the danger level by looking her seductive best in an evening gown, bold jewelry, stilettos and red lips. Make an entry with a Martini glass (sparkling water and olives) and a license to kill others with envy! After Bajrangi, it’s daddy’s turn to win hearts now but without the dishum dishum! Carry your daughter over your shoulders as you play the scruffy simpleton with a heart of gold. Bajrangi Bhaijan: the look is as simple as the character. Wear a fitted (almost tight) kurta or kurta shirt over khakis. Keep the tones earthy with maroons, olive green, rust, mustard and browns. Complete the look with a 2 day stubble, clip on earrings and the very popular Hanuman gadda locket and a big smile. Extra : Layer the look with a similar tone sweater and mark the forehead with tilak. You can also carry a simple canvas bag across the shoulders. Munni: Munni’s made up of all things pretty and innocent. Dress your daughter in a printed loose kurta & salwar. Wrap a bright pink shawl (or dupatta) loosely around the neck allowing her messy hair to fall naturally. To add effect you my want her to use hand gestures so make sure she wears colourful glass bangles. Extra : Apply some cheek stain to get the mountain girl flushed cheeks. Sing the chart topping movie song and take a selfie to capture your daughter piggy riding her hero. Show your mickey & Minnie what a great sport you can be. Walk with them as Pete - the greedy and not-so-goodie character from the Mickey clubhouse. Carry their candy without eating it as you role-play both - the meanie and the caring daddy! Pete: Unless you are really tall and over-weight, you can start by tying a pillow around your waist. Cover your arms by wearing a black full sleeves black t-shirt. Layer with a pale blue shirt and roll up the sleeves till above the elbow. Them comes the dungarees / overalls and the big brown shoes. Laugh heartily and you’d have transformed yourself into mighty Pete! Extra : Wear a pair of white cotton gloves and make big eyes when you see your children eat too much candy! Mickey & Minnie Mouse : The great thing about these iconic characters is that there are plenty ways to get the looks. The basic requirement being: black arms and legs, yellow shoes, red shorts or red n white polka dotted skirt. And of course those large mouse ears. One can fine-tune the costume by adding large white buttons, white gloves on hands and the bow on Minnie Mouse’s ears band. Extra: paint the nose black for that adorable mousey face. You can also carry Mickey’s favourite food - corn cob - as a prop. 4. Jellyfish Family – A family all will love to hug! Show your family’s creative skills by dressing up like jellyfish. The costumes look beautiful and allow all age groups and gender to look almost identical once dressed up. Head gear: transparent umbrellas, broad, long white ribbon, bubble wrap sheets cut into long strips, white tinsel strings, tape and a helping hand. Hang ribbons (straight or curled) along with bubble wrap strips all around the umbrella, from the inside. The length of these tentacle / arms should be atleast till your knees. Clothes: Kids can wear soft coloured / white leggings with fitted t shirts. Girls can add some delicate details with tutu skirts. Adults: Women can wear lace or crochet tops to add texture and long frilly skirts for soft movements. The men can wear loose pants and long sleeved shirts/t-shirts. The important thing to remember is to keep the clothes monochromatic. For an outdoor / day event you can also choose to add colour. Each family member can become his or her favourite colour jellyfish for the day! Extra : Go the extra mile and add fairy lights and a carry bubble gun. The added drama is sure to draw gasps from the other party creatures. 5. Minion madness– how big is YOUR family? Include nieces, nephews, neighborhood kids and whoever wants to join in this pesky platoon. Minions serve the evil masters in the movies but your bunch of yellow cuteness will get special treatment when they march out together in costume. Minions have a distinct look like no other characters. The look is easy to wear and there are many costume options for both boys and girls. Top: Yellow long sleeved t shirts or high neck t shirts. The more yellow the better. Extra: wear black gloves over the long sleeves to complete the look. Hair details: stiff wool / black plastic straws. Minion fact: Minions may be of the same size, colour and shape but each minion is different! Which one will you be? ?